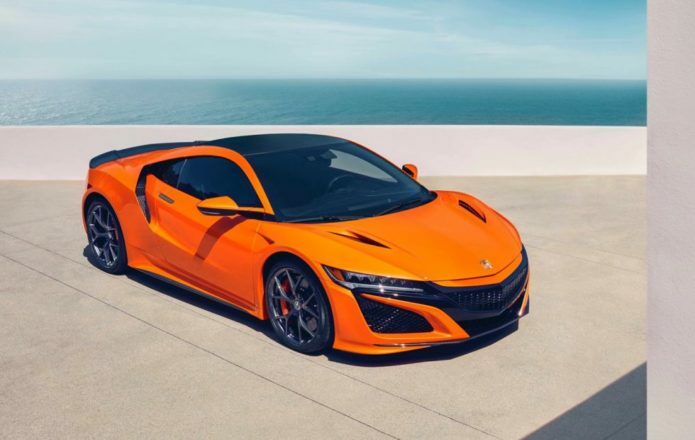 Acura’s potent hybrid sports car is getting a refresh, with the 2019 Acura NSX making its debut at Pebble Beach Concours d’Elegance this year. Promising new styling, a more upscale interior as standard, and performance improvements courtesy of chassis upgrades, it should leave the NSX even more capable. The Sport Hybrid SH-AWD drivetrain is the same, with a twin-turbocharged mid-mounted V6 engine combined with a total of three electric motors and a 9-speed dual clutch transmission. An electric Direct Drive Motor is integrated with the gas engine and the gearbox, making sure torque is instantaneous. Meanwhile, two electric motors in the front Twin Motor Unit can push power to each of the front wheels. That way you get true torque vectoring, as well as a total of 573 horsepower and 476 lb-ft of torque. For the 2019 NSX, Acura has added larger front and rear stabilizer bars, increasing stiffness by 26- and 19-percent respectively. The rear toe link bushings are 21-percent stiffer, and rear hub rigidity is up 6-percent. Thanks to newly calibrated software, including tweaks not only to the hybrid system but the active magnetorheological dampers, electric power steering, and other systems, Acura says there’s a noticeable improvement in both performance and driving dynamics. Understeer and oversteer are said to be more readily controlled at the limit, and the car as a whole is described as more playful. On the Suzaka Circuit, meanwhile, the automaker says the 2019 NSX bested its predecessor by almost 2 seconds. The standard brakes have iron rotors and black calipers; for 2019, red calipers are a $700 upgrade. The carbon ceramic brakes with black calipers remain a $9,900 option. However, this year you can have them with orange calipers – or silver or red – for $10,600. The old Continental SportContact 5P tires have been replaced by new SportContact 6 rubber, specially designed for the NSX. They’re designed to suit all seasons, both on the road and the track, with a revised tread pattern, construction, and rubber compound. Pirelli P Zero Trofeo R rubber remains an option, at $1,500, for track use. Acura’s styling changes have been fairly focused. There’s now a body-color front grille, rather than the silver trim of before, and the front grille surround, air intake mesh, and rear bumper outlet mesh all get a high-gloss finish. The optional carbon fiber decklid spoiler, available for $3,000, is now gloss instead of matte. Most eye-catching, there’s now a Thermal Orange Pearl paint finish, a $700 option. Inside, there’s now an Indigo blue option for the semi-aniline leather and Alcantara sports seats. The Milano leather manually-adjustable sports seats are a no-cost option, while $1,000 gets you the full leather sports seats. The latter can now be had in Full Red, too. The $3,800 carbon fiber interior sport package now includes a black Alcantara headliner, previously a separate add-on. As for total pricing, Acura says that the 2019 NSX will now start at $157,500 (plus $1,800 destination). That’s $1,500 more than the 2018 NSX, but you also get more standard kit: 4-way power sports seats, navigation, ELS Studio premium audio, proximity sensors, and aluminum sports pedals are now all included as standard. Previously, they’d have totaled $4,700 in options on the old car. It’s fair to say the second-generation NSX has been a stealthy option in the supercar world; indeed, if you’re looking for a rare performance vehicle, Acura’s coupe could be the model to have. The company says that it has sold more than 1,900 of the second-gen cars worldwide across the 2017 and 2018 model years, with almost 1,000 of those in the US. The order books for the 2019 NSX open today, with deliveries expected from October this year.